With the fourth-quarter round of 13F filings behind us it is time to take a look at the stocks in which some of the best money managers in the world preferred to invest or sell heading into the first quarter. One of these stocks was Toronto-Dominion Bank (NYSE:TD). Is Toronto-Dominion Bank (NYSE:TD) a healthy stock for your portfolio? Prominent investors are selling. The number of bullish hedge fund positions retreated by 3 recently. 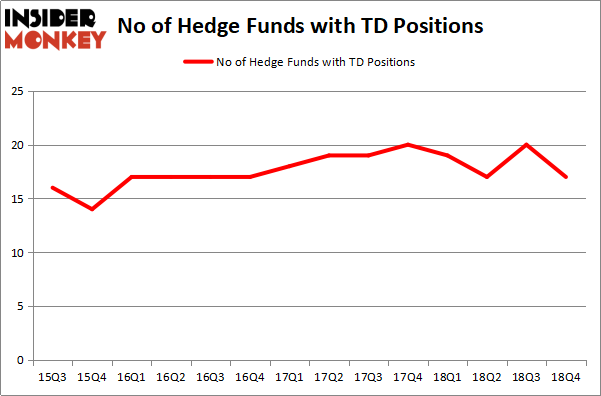 Our calculations also showed that TD isn’t among the 30 most popular stocks among hedge funds. Today there are plenty of formulas stock market investors use to appraise publicly traded companies. Some of the best formulas are hedge fund and insider trading sentiment. Our researchers have shown that, historically, those who follow the best picks of the elite fund managers can beat the S&P 500 by a superb margin (see the details here). Let’s review the recent hedge fund action regarding Toronto-Dominion Bank (NYSE:TD). What have hedge funds been doing with Toronto-Dominion Bank (NYSE:TD)? At the end of the fourth quarter, a total of 17 of the hedge funds tracked by Insider Monkey were bullish on this stock, a change of -15% from one quarter earlier. On the other hand, there were a total of 19 hedge funds with a bullish position in TD a year ago. So, let’s review which hedge funds were among the top holders of the stock and which hedge funds were making big moves. Among these funds, Renaissance Technologies held the most valuable stake in Toronto-Dominion Bank (NYSE:TD), which was worth $344.8 million at the end of the third quarter. On the second spot was Arrowstreet Capital which amassed $152.9 million worth of shares. Moreover, AQR Capital Management, Citadel Investment Group, and D E Shaw were also bullish on Toronto-Dominion Bank (NYSE:TD), allocating a large percentage of their portfolios to this stock. Seeing as Toronto-Dominion Bank (NYSE:TD) has faced falling interest from the smart money, we can see that there is a sect of fund managers who were dropping their positions entirely heading into Q3. 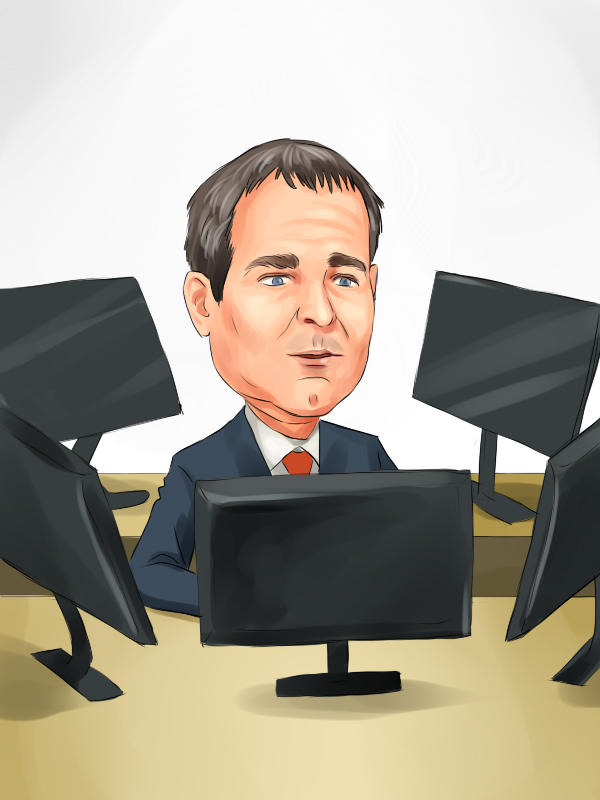 At the top of the heap, Andreas Halvorsen’s Viking Global dumped the largest position of the “upper crust” of funds tracked by Insider Monkey, comprising an estimated $79.9 million in stock. Brad Dunkley and Blair Levinsky’s fund, Waratah Capital Advisors, also said goodbye to its stock, about $15.4 million worth. These moves are intriguing to say the least, as total hedge fund interest was cut by 3 funds heading into Q3. Let’s check out hedge fund activity in other stocks similar to Toronto-Dominion Bank (NYSE:TD). We will take a look at Texas Instruments Incorporated (NASDAQ:TXN), Thermo Fisher Scientific Inc. (NYSE:TMO), Costco Wholesale Corporation (NASDAQ:COST), and Itau Unibanco Holding SA (NYSE:ITUB). This group of stocks’ market valuations resemble TD’s market valuation. As you can see these stocks had an average of 44.25 hedge funds with bullish positions and the average amount invested in these stocks was $2630 million. That figure was $887 million in TD’s case. Thermo Fisher Scientific Inc. (NYSE:TMO) is the most popular stock in this table. On the other hand Itau Unibanco Holding SA (NYSE:ITUB) is the least popular one with only 18 bullish hedge fund positions. Compared to these stocks Toronto-Dominion Bank (NYSE:TD) is even less popular than ITUB. Our calculations showed that top 15 most popular stocks among hedge funds returned 19.7% through March 15th and outperformed the S&P 500 ETF (SPY) by 6.6 percentage points. A small number of hedge funds were also right about betting on TD, though not to the same extent, as the stock returned 15.3% and outperformed the market as well. Itau Unibanco Holding SA (ITUB): Are Hedge Funds Right About This Stock? Do Hedge Funds Love Diageo plc (DEO)? Were Hedge Funds Right About Buying United Technologies Corporation (UTX)? Were Hedge Funds Right About Buying Costco Wholesale Corporation (COST)? Hedge Funds Have Never Been This Bullish On Thermo Fisher Scientific Inc. (... Were Hedge Funds Right About Dumping Twenty-First Century Fox Inc (FOX)?